The 2015 OECD Recommendation of the Council on Gender Equality in Public Life promotes a government-wide strategy for gender equality reform, sound mechanisms to ensure accountability and sustainability of gender initiatives, and tools and evidence to inform inclusive policy decisions. It also promotes a “whole-of-society” approach to reducing gender stereotypes, encouraging women to participate in politics and removing implicit and explicit barriers to gender equality. 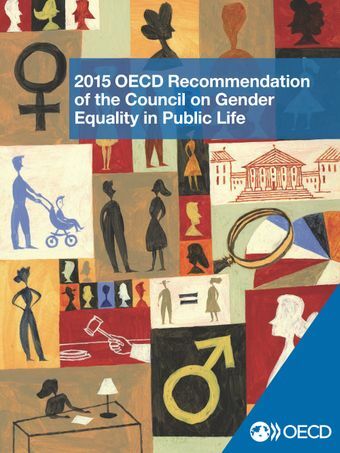 This Recommendation is unique, as it provides not only governments, but also parliaments and judiciaries, with clear, timely and actionable guidelines for effectively implementing gender equality and gender mainstreaming initiatives, and for improving equal access to public leadership for women and men from diverse backgrounds. The Recommendation looks to achieve gender equality in the public sector through three main channels, policy, as a role model for the private sector & through its own employment practices. mainstream gender equality in the design, development, implementation and evaluation of relevant public policies and budgets. strengthen accountability and oversight mechanisms for gender equality and mainstreaming initiatives across and within government bodies. achieve gender balanced representation in decision making positions in public life by encouraging greater participation of women in government at all levels, as well as in parliaments, judiciaries and other public institutions. take adequate measures to improve the gender equality in public employment. strengthen international co-operation through continuously sharing knowledge, lessons learned and good practices on gender equality and mainstreaming initiatives in public institutions. The Recommendation was launched at 'Women's access to leadership: what works?' on International Women's Day, 8 March 2016.